Disabled People Against Cuts (DPAC) have produced a report detailing the ongoing misuse of statistics and outright fibs which have been fed to the press by Iain Duncan Smith and the DWP. The campaign group say: “At the end of this month, the Department for Work and Pensions will be releasing their Annual Report, and Iain Duncan Smith and his henchministers will no doubt be touring the TV studios to deliver more propaganda about worklessness and disability. The Independent Living Fund was established as a ring-fenced sum of money which could be accessed by severely disabled people who often need expensive 24 hour care. This funding has made it possible for people to remain in their homes rather than in institutions. In 2010 the fund was closed to new applicants. Last year the Government decided to close down the fund completely and make local Councils responsible for administering funding. Local authorities will not have to ring fence any money from Central Government for this kind of support meaning they cash strapped councils may simply divert the money elsewhere. With local authorities already buckling under harsh cuts, soaring homelessness and an upcoming Council Tax crisis, many may choose to place some disabled people back in (no doubt privately run) care homes in an attempt to cut costs. Support is needed urgently to save this vital funding which allows the most severely disabled people to stay in their homes and lead independent lives. Those in London join the vigil to save the Independent Living Fund on March 13th. Pic from the highly recommended Crippen Cartoons. Yesterday’s Right To Ride protest, organised by Disabled People Against Cuts (DPAC) and Transport For All, revealed the real barriers disabled people face when forced to depend on a public transport system which is unfit for purpose. After a lobby in Parliament scores of people met at the Abingdon Street bus stop opposite the Palace of Westminster. 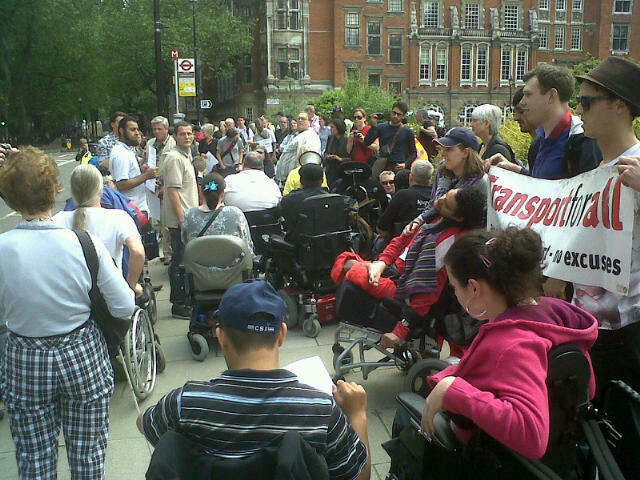 Several speeches were made to a swelling crowd and then at 4pm a line of wheelchair users formed to attempt to take the 87 Bus to Transport For London headquarters in Covent Garden. Unfortunately when the bus arrived wheelchairs users were unable to board due to the bus stop being inaccessible. This prompted a spontaneous protest as people moved out into the road and blocked the bus from leaving. 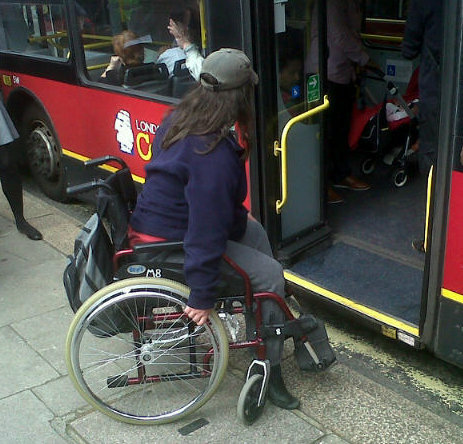 A second bus turned up shortly afterwards which was also blocked after denying disabled people access. The blockade lasted for about an hour, before the disabled protesters and supporters agreed to leave together. According to a Transport For All survey in 2010, only around 50% of London bus stops comply with legislation aimed at ensuring access for disabled people. On the tube the situation is even worse, with just 64 out of 240 stations having step free access. Hundreds of thousands of sick and disabled people are soon to be stripped of Disability Living Allowance (DLA). This benefit, available to those in and out of work, is designed to help people mitigate the huge costs in transport, care and personal equipment of living with a disability. DLA is also a ‘passport’ benefit, meaning that those who qualify often automatically qualify for motability schemes, which provides items such as wheelchair suitable transport, and taxi card schemes. Other community transport schemes are also falling victim to brutal cuts. Yesterday’s protest was a well timed (and well supported) action which revealed a glimpse of the chaos that will be caused in people’s lives if they are forced onto a public transport system which is not designed for their needs. 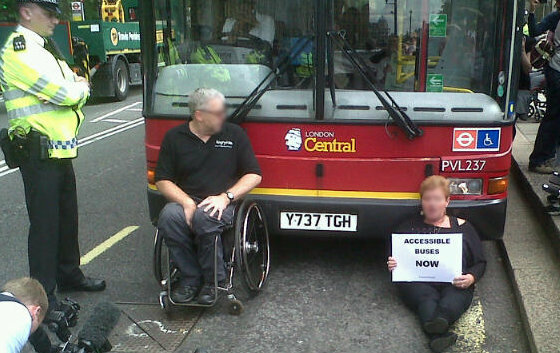 It is not bus driver’s fault that buses are inaccessible – they deserve everyone’s support when they strike this Friday. Disabled People Against Cuts (DPAC) and Transport For All will be holding a day of action on June 19th aimed at the lack of accessible public transport and the brutal upcoming cuts to disablity benefits. The Government are planning to cut vital benefits from 20% of disabled people, leaving hundreds of thousands of people no longer able to afford care, specialist equipment or transportation costs. The protest will highlight the lack of accessible transport and how these cuts will force disabled people out of the workplace and trap people in their homes. DPAC will be asking activists to attend a lobby at the House of Commons in the afternoon (time tbc), and then travel by bus to the Confederation of Passenger Transport, the umbrella body for all European bus companies in Covent Garden area. For those not wishing to attend the lobby meet at 4pm either outside House of Parliament visitor entrance or at Abingdon Street bus stop, next to Victoria Tower and more or less opposite College Green. Keep an eye on the DPAC or Transport For All websites for the latest details of the protest.